Candidate fraud has become one of the hardest-to-solve problems in talent acquisition industry. Filtered.ai will not auto-reject a candidate based on their behaviour. However, we analyze every interview submission and provide important information to you. As a reviewer, you will receive an email notification whenever your candidate has finished an interview. Included in this email is a list of all activities which you should pay attention to. Furthermore, the same “confidence analysis” report can be found on your candidate’s profile inside the app. Although we do not allow a candidate to copy+paste into the codepad by default, sometimes we still find that a candidates’ solution to a question is incredibly similar to that of others. Such striking similarity is very rare in normal cases, as different people have different styles when writing code. We can usually assume this is because the solution has been shared online or shared to other candidates directly. To detect this, we run a code similarity comparison internally across all candidates using Filtered and beyond, and highlight candidates whose solutions have high similarity. In advanced mode, you can even see a diff of two matching pieces of code. Technical recruiters and hiring managers can use this tool to make decisions accordingly. Occasionally, candidates open a lot of tabs before and during the interview. For open-ended video questions and coding challenges, this can be problematic, since the candidates might be searching for answers online. We detect all the open tabs during an interview, run analysis on them, and mark all the highly-relevant ones. Reviewers can look at the tabs and visit the sites in order to better evaluate whether to trust this candidate. There are a number of reasons that a candidate’s mouse cursor (pointer) can leave the testing environment. Sometimes, a candidate is using two monitors or a separate IDE. Other times, however, they might be opening new tabs so search for answers. We recommended that you combine the mouse exit count with other signals like the number of tabs opened in order to make a judgement about the candidate’s performance. Candidates should do their interviews by themselves, and they have to agree to let Filtered take occasional snapshots of them while they work via their webcam. We run computer vision analysis on all of the snapshots and flag any moments where multiple faces appear on camera. Sometimes these other people are just passing by, but once in a while it is obvious that the candidate is getting help (we’ve even seen the candidate change to a different person halfway through a test!). If a lot of snapshots are flagged, the reviewer will be alerted, but all the flagged snapshots are marked and viewable regardless. In order to submit their interview, candidates must authenticate using Linkedin, Facebook, Github, Bitbucket, or Gitlab. Github is the most commonly-used platform by developers. Occasionally, Filtered will notice that a candidate has an empty github (no repos/activity) or has created their github account just to submit the interview. These may be indicators which they are trying to hide their identity. We recommend combining this alert and other confidence analysis alerts in order to make a judgement call. 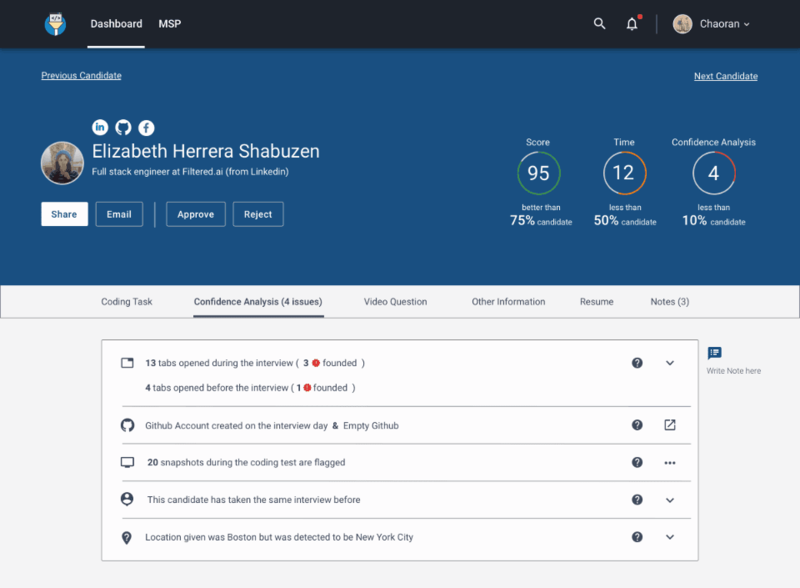 Filtered tracks IP addresses and knows where the candidate has taken their test. Occasionally, this location is not the same as where the candidate claims their are taking it. If the distance between the two locations is within a certain range, this may be fine, as the candidate might be generalizing their location (e.g. saying “Boston” instead of the exact location of the suburb “Quincy, MA”). However, if the two locations are in different countries, this is something that you should dig into further in order to verify the candidate’s identity. This issue applies specifically to MSP accounts. There are times when the same candidate takes the same test through different vendors in order to pass the test and beat the screening rules. Filtered runs internal analysis across all interviews and flags any duplicate submissions. Recruiters and MSP managers will receive a notification about the flagged candidates if any duplications occur. Video interviewing, code challenges, fraud protection, and more are a click away. © 2019 Filtered Ai. All rights reserved.